Adapts "Evil Shows His Face"
Adapts "Evil Shows His Face" and "The Dancing Digimon"
The light from Tai's Digivice frees Leomon from Devimon's thrall, and, calling the kids "DigiDestined," he gets Tai to safety before once again falling under Devimon's control. A short time later, Joe, Sora and their Digimon have wound up together on a portion of the island, where they find a church, only to be captured by the Bakemon masquerading as humans within it. The ghostly Digimon plan to eat the two kids, but Biyomon and Gomamon are able to trick their way out of their cell, only to have the Bakemon all merge into the giant Lord Bakemon. While the Champion Digimon struggle with him, Joe recites Buddhist chants to dispel Lord Bakemon's evil, weakening him enough for the Digimon to destroy him. Adapts "A Clue From The Digi-Past" and "DigiBaby Boom"
On another part of the shattered File Island, Mimi and Tentomon have gotten themselves lost in a maze with an ancient temple, as Izzy attempts to decode the temple's hieroglyphics in an attempt to guide them out. As he leads them through the maze, they are attacked by its guardian, Centarumon, who has fallen prey to another of Devimon's Black Gears. Palmon and Tentomon Digivolve and blast the gear out of him, and he then attempt to tell them about the nature of their Digivices, except Leomon interrupts the explanations, but is repelled by the light of the Digivices. Izzy then continues his attempts to decode all the hieroglyphics, and in her impatient anger, Mimi kicks a gear jutting out of the ground, causing it to move in the opposite direction, sending their portion of the island back towards the others. Chapter Eleven: "The Lion's Share of the Battle"
Adapts "DigiBaby Boom" and "Legend of the DigiDestined," including a reference to "Subzero Ice Punch!" The guardian of Primary Village, Elecmon, attacks T.K. and Patamon, thinking that they want to hurt his babies, but rather than have them fight, T.K. suggests that Elecmon and Patamon have a tug-o-war instead. Patamon wins, and Elecmon makes peace with them. As the sun starts to set, T.K. and Patamon are about the leave the village, when suddenly, a massive, powered-up Leomon bursts onto the scene, and is about to attack T.K. when Tai, Matt and their Digimon arrive to fend him off (explaining that they got held up by a Mojyamon). 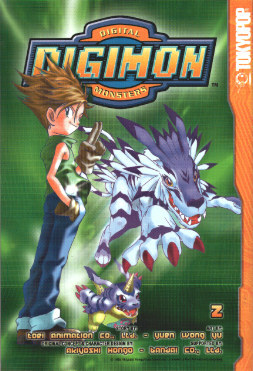 When Leomon fights back and proves more than a match for Greymon and Garurumon, the other four kids and their Digimon show up, and Izzy advises Tai and Matt to use their Digivices, successfully purifying Leomon and ridding him of the Black Gears controlling him, restoring him to normal. Leomon then tells them of the legend of the DigiDestined - they are the seven children who will save the DigiWorld. Chapter Twelve: "An Angelic Transformation"
Adapts "The Legend of the DigiDestined" and "Departure for a New Continent"
Empowered by the Black Gears, Devimon grows to a massive height and takes the fight to the DigiDestined. Alongside Leomon, their Champion Digimon attack, but even their best isn't good enough as Devimon takes all that they've got, and cuts them down. Devimon then turns on Patamon, who finally Digivolves into his own Champion form - Angemon. Taking power from all the Digivices, Angemon unleashes his Hand of Fate on Devimon, destroying him, but also using up all of his own energy as well. He and Devimon delete, but then Angemon's remains reform into a Digi-Egg. But there's no rest for the kids, as suddenly, a holographic projector emerges from beneath the ground, and displays image of Gennai, a kindly old man who tells the DigiDestined that their work is not yet done. They must now head out across the DigiWorld to gather the Tags and Crests that will give them the power they will need to defeat their next foe. With help from all the Digimon they have befriended on File Island, the kids construct a raft, and head for their next adventure. Chapter Thirteen: "A Whale of an Adventure"
Adapts "Departure for a New Continent"
Out on the open sea, Patamon's Digi-Egg hatches into Poyomon. Then, the DigiDestined are attacked and swallowed by the colossal Whamon, who had a Black Gear jammed in his stomach. Agumon destroys it, and Whamon regurgitates the team, thanking them for their help, and taking them to an underground cave containing a convenience store, where, after Ikkakumon fends off an attack from Drimogemon, Poyomon discovers a box that holds the kids' Tags. But as Whamon carries the kids on to the continent of Server, a new evil is ready for their approach... Etemon! Chapter Fourteen: "Tokomon's Great Escape"
Adapts "The Dark Network of Etemon," and a teeny bit of "The Arrival of Skull Greymon"
Quite a few pop culture references in this volume's chapter titles - Chapter Eight, "Heartbreak Hotel," references the Elvis Presley song of the same name, Chapter Ten, "A-maze-ing Race," is a reference to the well-known hymn, "Amazing Grace," and Chapter Thirteen, "Tokomon's Great Escape," appears to be a reference to the Steve McQueen movie, "The Great Escape." Devimon taking control of Leomon for the first time is removed from the start of the events of "Evil Shows His Face," and is instead related at the end of it, in flashback form. The events of "Subzero Ice Punch!" are not included in the manga, but they are alluded to by Tai in Chapter Eleven, meaning that although we didn't see them, they did occur in the manga continuity. Frigimon is even among the Digimon who come to help the kids build their raft in Chapter Fourteen. The same applies to the scenes of Ogremon emerging from a crate to attack Joe and Gomamon in the middle of the ocean, and Sora subsequently fishing him out. We don't see it, but presumably, it did still happen. AND it also applies to roughly the first half of "A Clue From The Digi-Past," which is omitted, but did occur - we simply skip ahead to when Mimi and Tentomon are lost. Also, we definitely know that Mimi encounters Sukamon and Chuumon here, even though we don't see it, since she knows Chuumon when the kids meet up with him again later in Volume Four. "A Clue From The Digi-Past" and "The Dancing Digimon" are swapped around - in the manga, "Clue" comes first, and "Dancing" is after that, while in the anime, the episodes were the other way around. Rather than calling upon Lord Bakemon and having him appear, the Bakemon in the manga actually merge to form him. And the manga doesn't make the edit that the dub did, retaining the Buddhist chanting that defeats Lord Bakemon, rather than replacing it with mind over matter. During the events of "Legend of the DigiDestined," Joe and Sora return at the same time as Izzy and Mimi, rather than a bit later on, as they did in the anime. Although the manga is noted for it's abbreviation of the anime's events, and as such, I don't list *every* tiny, inconsequential-event-removal in these guides (the very fact that the scene is inconsequential is why it's not in the manga), one notable scene from "The Legend of the DigiDestined" is absent - Ogremon's further appearances after being consumed by Devimon. The fact we never see him emerge from Big D makes his reappearance in Volume Five a bit odd. Agumon destroys the Black Gear inside Whamon, unlike the anime, in which Tai used his Digivice on it. When T.K. has to sing to the Baby Digimon, the lyrics he produces are from the N*Sync song, "Bye Bye Bye." But that's not to say that English adaptation writer Lianne Sentar is a fan of boy bands - when Etemon describes his Concert Crush attack, he calls it "more painful than my boy band attack!" The illustration of Ogremon on page 10 is a direct copy of his model sheet, as is the image of Whamon on page 123.